Part of the problem with nomenclature is that the trivial names can cause a lot of confusion. By themselves, the IUPAC names are at least logical, if sometimes unwieldy – it might be a good plan to just stick to one system as much as possible. 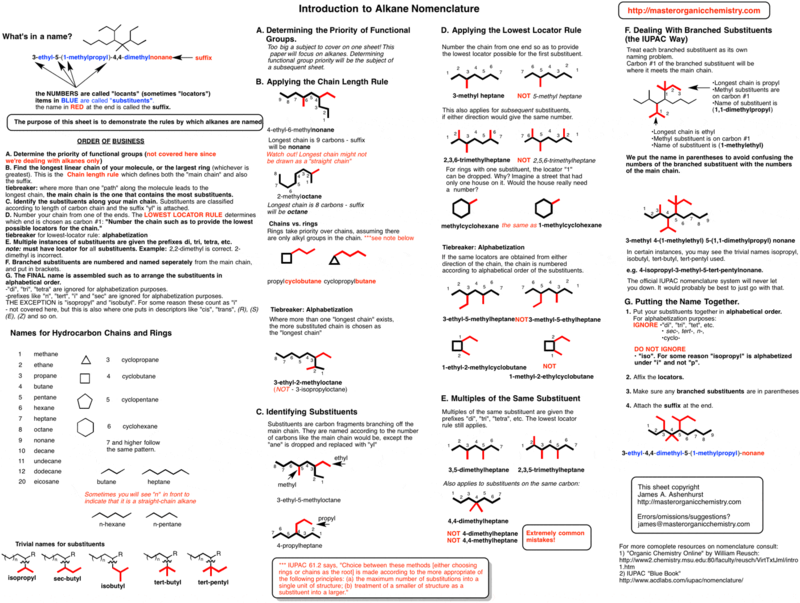 I thought it would be worthwhile to put all the important rules for alkanes together in a new summary sheet. I’ve never been the biggest fan of doing nomenclature,, but sometimes when you don’t like something the best way to get over it is just to force yourself to do it.By the end it was actually kind of fun. From the sheet, here are the 7 core steps for naming alkanes and derivatives. B. Find the longest linear chain of your molecule. This is the “Chain length rule” which defines both the “main chain” and also the suffix. -tiebreaker: where more than one “path” along the molecule leads to the longest chain, the main chain is the one that contains the most substituents. C. Identify the substituents along your main chain. Substituents are classified according to length of carbon chain and the suffix “yl” is attached. E. Multiple instances of substituents are given the prefixes di, tri, tetra, etc. -note: must have locator for all substituents. Example: 1,1-dimethyl is correct. 1-dimethyl is incorrect. 1,1-methyl is incorrect. These are common mistakes. F. Branched substituents are numbered and named seperately from the main chain, and put in brackets. G. The FINAL name is assembled such as to arrange the substituents in alphabetical order. -“di”, “tri”, “tetra” are ignored for alphabetization purposes. -prefixes like “n”, “tert”, “i” and “sec” are ignored for alphabetization purposes. THE EXCEPTION is “isopropyl” and “isobutyl”. For some reason the “i” counts for alphabetization here. – This is also the point where stereochemistry prefixes such as “cis”, “trans”, (E), (Z), (R), (S) and so on are added. As always any feedback, comments, clarifications, and omissions/errors in the sheet would be appreciated. Two things I believe but am only 95% sure on. 1) I believe that the “cyclo” prefix is ignored for alphabetization purposes, similar to how “di”, “tri”, etc. are ignored. 2) I believe that cyclic alkanes take priority over alkanes, so “butylcyclopropane” is correct instead of “cyclopropylbutane”. Anyone who can clarify this for me will get a postcard from Jerusalem along with an indecipherable fridge magnet. EDIT: (Jan 2011) – revised version posted, fixing some mistakes. For simple cycloalkanes with simple alkyl substituents, the ‘half’ with the most number of carbons is the parent. When one is more complex than the other, the ‘cooler’ half is the parent. I always thought that too. My version of chemdraw keeps spitting back the cycloalkane as the parent, however, so I was wondering if it knew something I didn’t. Haven’t found a clear answer for pure alkanes. On the “Trivial names for substituents” section, isobutyl is incorrectly drawn. Quick question: the example that you give in the top left-hand corner of the Summary Sheet #6 pdf, is it also correct to name the alkyl group on the 5th carbon as “sec-butyl” instead of “1-methylpropyl”? Or am I mixing things up? Yes, 1-methylpropyl is also known as s-butyl !